The battle was going poorly for the Patriots. It was January 3, 1777 and after having been pinned against the banks of the Delaware River by a very large British army the day before, the Continental army made a risky night march around the British army’s flank to escape certain doom. General George Washington’s small ragged army had nearly reached the small village of Princeton, NJ when they noticed across some open fields British soldiers marching on a different road going the opposite way. The British soldiers were part of the larger army’s rearguard. The two forces immediately headed to clash in the open fields just south of the town. General Hugh Mercer led his Continental brigade to meet the British threat. 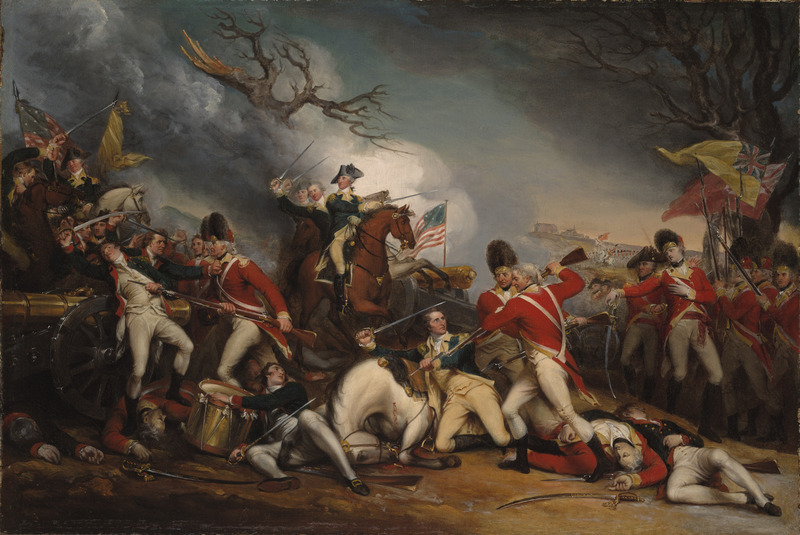 This painting by John Trumbull shows the climatic moment of the Battle of Princeton as General Mercer is killed (on the ground next to his horse) and Washington rides to save the day. The morning was icy cold. The soldiers began the action in earnest. The British regulars made short work of Mercer’s brigade. After engaging in a firefight, the British lunged forward with a bayonet charge. The American troops were thrown back in confusion. General Mercer, thought by the British troops to be Washington, was surrounded and bayoneted seven times and left for dead. The fleeing men from Mercer’s brigade started to create a panic among other brigades in Washington’s army as they ran pell-mell through the reserves under General John Cadwalader. Many of Cadwalader’s men began to flee as well. At this moment, the victories at Trenton, the night march, and in many respects, the war itself, were all in the balance. If Washington’s small force were to be crushed here at Princeton, popular support for the Revolution could potentially be siphoned away, and the American cause could be lost. The stakes may have never been higher. In this scene you can see the snow that was on the ground at the time of the battle. Survivors remember seeing blood from dead and wounded men pool on the frozen ground. And it was at that moment when none other than General Washington arrived on the field personally. What an amazing sight it must have been to see. Washington, renowned as one of the country’s best horse riders, riding up to the front lines of battle to direct the movements of his men in a time period where generals of his rank were more properly positioned in the rear to direct movements. Washington saw the potential collapse and determined to personally appeal to the bravery of his men. Washington also brought with him more troops that he immediately placed on the line. Then, as Continental artillery kept the British as bay, he rode into the panicking and retreating soldiers. Sergeant Nathaniel Root with the 20th Continental Regiment remembered this moment vividly: “At this moment Washington appeared in front of the American army, riding towards those of us who were retreating, and exclaimed, ‘Parade with us, my brave fellows! There is but a handful of the enemy, and we will have them directly.’” Inspired by his courage and reassured by his presence, the men halted their retreat and reformed their lines. This image of the Battle of Princeton was actually painted by the deaf son of the slain General Hugh Mercer, William Mercer. After defeating the British at Princeton, the American army went into winter quarters in Morristown, NJ. 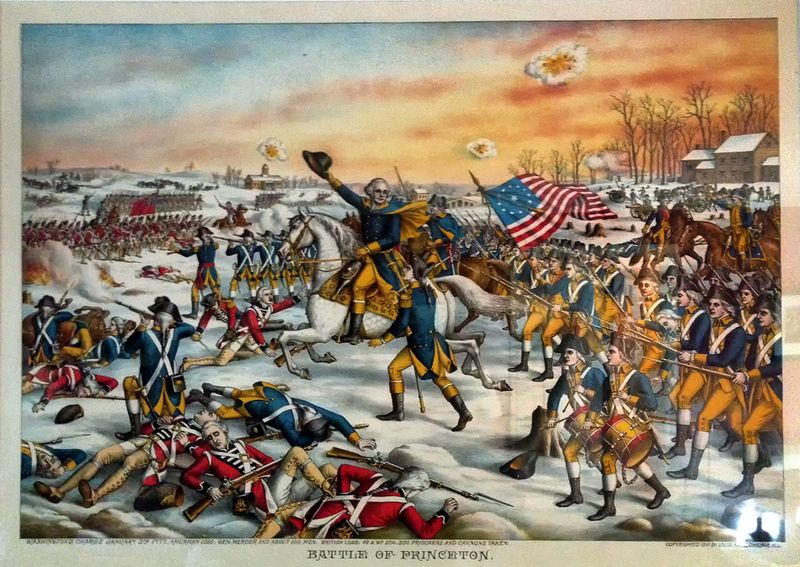 The result of Washington’s brilliant victories at Trenton and Princeton was a huge boost to American morale. The militia in New Jersey rose up, enlistments in the army rose, and foreign powers took note as the vastly superior British army was forced back to the city of New York, showing they were unable to conquer New Jersey. The war would continue for another five bloody years, but Washington had saved the American Revolution from being killed in the crib. The ground where this battle occurred truly should be remembered as some of America’s most hallowed ground. Some of it was saved and made into Princeton Battlefield State Park. Unfortunately, other parts of the land where Washington’s men charged across is currently being bulldozed and destroyed by the Institute for Advanced Study to build dorm rooms. It is incumbent among all Americans to preserve these sacred places so that the memories of these national significant events are not lost for future generations. I encourage you to spread the story of Washington’s Charge. But also take action now, through The Princeton Battlefield Society and Campaign 1776 and make it known to the Institute for Advanced Study (contactus@ias.edu) that they are destroying a valuable piece of American history and one of the most inspiring stories in our nation’s history. I absolutely love the Trumbull painting. And that’s a great story. Thanks for posting.